Not effeted by 2011 Wallow Fire!! Greer...in the heart of Arizona's White Mountains where you'll enjoy the pristine forests of our secluded mountain valley. Delightfully cool summers, fantastic fall color, winter white splendor and the quiet fresh solitude of spring! Escape to crisp pure mountain air and a variety of recreational opportunities. Hiking, Mountain Biking, Bird and Wildlife watching, Fishing, Skiing and lots more are just moments from your doorstep in beautiful Greer. Extra People $10.00 each per night. Same Owners / Managers! Make your reservations early to assure desired accommodations! We accept Visa, MasterCard and Discover, & American Express. Minimum stay: Two (2) nights are required. Three (3) night minimum on holidays. A Two (2) night deposit is required to reserve a cabin. One-half (½) deposit for longer visits. Our cabins are perfect for family reunions or large groups. They are grouped together and will accommodate 33 persons total. Discounts for reservations exceeding 7 days or more (One free night for every week you stay). Deposits are required within 7 days from the date of your reservation. Sorry, we do not accept pets. Cancellation Policy: No refunds unless we are able to re-rent the cabin. Check In: 2:00 p.m., Check Out: 10:30 a.m.
Greer Point Trails End Luxury Cabins offer you impeccably clean cabins nestled among the pines in the heart of Greer. Walk to fishing on the West Fork of the Little Colorado River. Hikers are within ¼ mile of the Baldy Trail. Sunrise Ski Park for skiers and snowboarders is only 15 minutes away. Adults, teens and children will enjoy watching deer graze nearby; squirrels, chipmunks, raccoons, bald eagles, herons and ducks are just a few of the species of wild life you'll enjoy in beautiful Greer. Why not make your reservation today? The Honeymoon Suite... Two person jacuzzi , has king casbah bed. kitchen shower, fireplace , carpet and deck. DISH w/sports. The large two (2) bedroom one level... King bed, queen bed, full bath, kitchen, fireplace, carpet & deck, TV , DVD & VCR (no smoking). 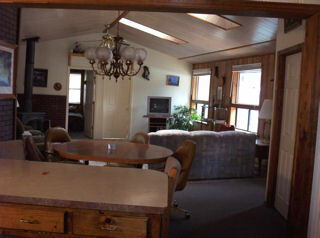 The one level three bedroom cabin... remodeled in 2008, accommodates 9 persons. King bed, queen bed, 2 Double Beds, queen hide-a-bed and 2 full baths. 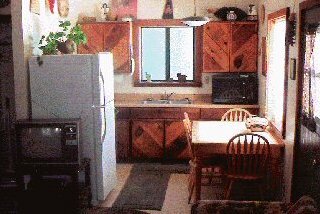 Large family style kitchen with side-by-side refrigerator, dishwasher, built-in microwave, full-sized stove/oven. Large living area, Dish TV, fireplace,, has a back patio area with woodstove for your outdoor fireside enjoyment. This unit has a DVD player and VCR with extra TV in Queen bedroom. 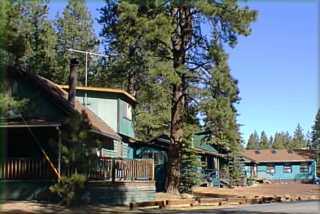 Our cabins are located in a narrow canyon surrounded by forested mountains. The Little Colorado River, frequently stocked with trout is within 200 yards. We offer you true country comfort in a rustic mountain setting! Our cabins are fully equipped housekeeping cabins in order to assure your comfort. Each cabin includes amenities to ensure you'll enjoy the great outdoors rather than worry about what you need! We provide cooking utensils (pots & pans) dishes, flatware, coffee maker, toaster and of course, linens, soap and paper products. Our fully equipped kitchens include full-size ranges with ovens and refrigerators. For your outdoor enjoyment you'll find a BBQ and lawn chairs right outside your front door. If you'd like to enjoy a cozy fire, you'll find firewood conveniently stacked outside your door too! Have a memorable vacation, anniversary, honeymoon, birthday or special occasion at Greer Point Trails End Luxury Cabins!